40% Bonus On Alaska Mileage Plan Miles Purchases Is Good – But Here’s How To Do Even Better! If you are a regular reader of InsideFlyer UK, you probably already know that I love Alaska Mileage Plan Miles. You might also know that (as a general policy) I hate buying Miles. When there’s a good sale on Alaska Miles, I therefore need to consider my options carefully, before deciding whether to bite or not. I’m sure I’m not the only one who likes to weigh these things up, so thought it would be a good idea to crunch the numbers here. Until 9th April 2018, you can buy Alaska Mileage Plan Miles with a bonus of up to 40%. My own bonus is actually lower this time, but we’ll use 40% as an example, in order to show that there’s actually a better way to buy Alaska Miles even if you have been targeted with the 40% bonus. Alaska Mileage Plan Miles usually cost ~£21.50 ($29.56) per 1,000. With a 40% Miles bonus, you’re therefore looking at ~£15.40 ($21.10) per 1,000. Given some of the remarkable things you can do with Alaska Miles, that’s not necessarily a bad deal – but we can do better! I posted last month about the current Starwood Preferred Guest promotion, where you can purchase ‘Starpoints’ with an excellent 35% discount. Starpoints normally cost ~2.5p (3.5 cents), so with the 35% discount, you’re looking at about 1.63p (2.275 cents) each. With the 35% discount (at the current exchange rate) you can buy 20,000 Starpoints for ~£330 ($455). The sale is on until 16th March 2018, so there’s still time to take advantage. Starpoints can be transferred over to Alaska Mileage Plan at a 1:1 rate, but you also get 5,000 bonus Miles on top when you transfer in blocks of 20,000. So, 20,000 Starpoints gets you 25,000 Alaska Mileage Plan Miles. Note that when you make a transfer from SPG to Alaska Mileage Plan, it usually takes a couple of days (and up to a week) for the Miles to end up in your account. If you prefer to earn your Miles through credit card sign-up bonuses, signing up to the SPG American Express credit card through a referral link (like mine here – many thanks if you use it as I’ll get some Starpoints too!) will net you a bonus of 11,000 Starpoints rather than the standard 10,000. You need to spend £1,000 within 3 months to trigger the bonus once you get the card, but will earn an extra 1,000 Starpoints for that as the standard earning rate is 1 Starpoint per £1. There’s an annual fee of £75 to bear in mind too, although you do get a pro rata refund if you cancel before the end of the year. By purchasing your Alaska Miles indirectly via SPG, you can pick them up for ~1.32p, rather than the 1.54p each you would pay if you buy directly – even assuming you are targeted for a 40% bonus by Alaska. The 35% discount on Starpoints is open to everyone. The other benefit of going down the SPG Starpoints route is that you have a lot more flexibility if you decide you’d rather transfer the Miles to a different airline loyalty programme (or need them to book a hotel). I’ll be giving the Alaska Miles sale a miss, but will be stocking up on Starpoints before the end of the promotion. Yeah, the latter- now corrected. Thanks for spotting it and letting me know! How frequently do SPG tend to run similar promos? They’ve run similar sales quite regularly over the last year or so. The best ever was a targeted 50% sale, but generally 30-35% is the best. I would hope to see another couple before the merger with Marriott Rewards is completed. Thanks Joe for pointing out the cost between the two promotions. Very helpful. The alaska promotion is probably only any good if you’ve already maxed out your spg purchase for the year and you are going for Cathay J awards on AS. I tried AS points purchase. Not that straight forwards to actually book an award fare. What’s showing as CX awards available on BA isn’t always available to AS. Have to ring AS up to book CX. You need skype or something to do this. Also for the AS awards that are searchable online, they often show mixed awards where the long haul part of the journey is in economy. I learnt the hard way about AS award booking. I managed to get mine booked…eventually! Yeah, Alaska can be a bit tricky for Cathay, for reasons you mention. Booking JAL etc, on the other hand, is an absolute doddle – even the multi-city stuff is fairly straightforward. Totally agree re mixed awards – definitely something you need to keep a keen eye on. Thanks Joe for that link. I’ll give it a read. I was aware of intra family SPG transfers but not about marriott or friends transfers! Part of the issue I had was that I saw some availability for CX awards, then tried to transfer the SPG points in two lots to AS. One lot appeared on my AS account within 2 days and the other took 6 days which was very stressful as no one at SPG or AS seemed to know what was going on and just kept saying ‘ring the other company’!! I was worried that the availability would go and was also worried there was an issue with the SPG transfer it took so long. I did manage to get the AKL-HKG on CX J but then there were no connecting flights to EUR for a couple of days so had to stay in HKG for 2 nights. Did eventually get HKG-CDG in PE but all in all it was quite stressful and I learnt a lot!! I am still monitoring the flights to try and get the HKG-EUR in J.
BTW have you an article or link on the best sweet spots on the AS chart in your opinion? Yep, Marriott makes it really easy now ($10 if you don’t have status though, which is a minor drawback). Ach, tell me about it! I’ve been meaning to write a post about the transfer times from SPG as it can indeed be quite stressful – I was booking some KrisFlyer awards for my parents recently and it was definitely frustrating. Amex MR Points transfer overnight, so I was able to book 1 ticket, but I was then waiting for a measly 7k Starpoints to transfer for over a week. Not a great situation when you need the last Business CLass seat that’s available on Points as a special anniversary treat! I would hope that something in J should turn up if you’re able to be flexible re where exactly. I once ended up having an interesting chat with Cathay cabin crew as to why on earth I was flying in First back to London via Zurich when they knew the direct London flights were pretty much empty in First that day (I wanted 2 seats together in F as was travelling with a friend and CX were only releasing 1 in F to London, despite the empty cabins). J is usually quite a bit easier. Excellent question – I’ve done a few example posts but don’t think I’ve ever put a proper list of sweet spots together – consider it added to my ‘to do’ list! Going CX J, AKL-HKG is definitely a sweet spot at 30K AS points and then HKG-EUR for 42.5k AS points is another sweet spot, however if you are trying to cobble together NZ-Asia-EUR this direction you’ll find the most availability is on Thursdays, AKL-HKG, then you find you can’t get any availability on CX for HKG-EUR till Sunday/Monday so that means a 2-3 night stay in HKG which defeats the purpose of the awards somewhat. I think it may be better to try *A awards via BKK to get to EUR from NZ as it’s an air Nz hub. Also the HKG-YVR-NY is also a sweetspot if you can find an AS agent that understands that you can stop over in YVR and that it is not two separate segments. What is not a sweetspot on AS is those mixed flights US-EUR where the long haul option is only in coach. 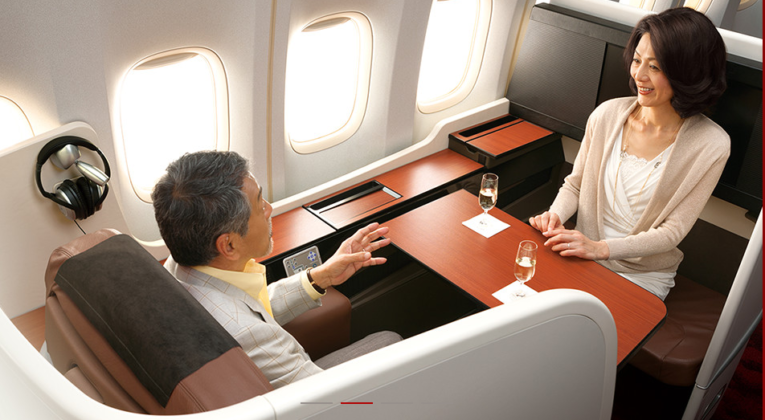 And then the other AS J partner options are with Icelandair, where to be honest, looking at their J offering looks more like the PE seats in Air NZ than the lie flat seats. Anyway I’m just a rookie but that’s just what I’ve found. I’m going to look at those QR specials in J AKL-LHR that you mentioned Joe for 1350GBP . Just wondering what the stopover/cancellation rules and surcharges are like. If they are ok then that’s pretty cheap and possibly cheaper than trying to do it via points. Just wondering if someone can help me. I got a marriott travel package and credited the points to Alaska. I am planning a trip to Europe from New Zealand in Sept/Oct this year. I can return either EUR-Asia-NZ or EUR-US-NZ. There is availability coming via the US one either BA or Icelandair J. Can someone tell me what BA or Icelandair J is like in comparison to say Air NZ J or Cathay J. I’ve flown Air NZ J but not CX J. Just wondering is it ok in BA J for eg? Do they have lie flat beds etc? I believe that Air NZ has the same seats as Virgin Atlantic. Those are definitely my preferred J seats. Personally, if going via the US, I would hop on a cheap ~£100 one way Norwegian/Primera/etc flight to Boston/NYC/etc and then use Alaska Miles from there. To NZ from the US, it would be just 55k for Biz or 70k for First on Qantas; 55k for Biz on Fiji Airways; 60k for Biz or 80k for First on Cathay. Redeeming Alaska Miles for transatlantic travel doesn’t tend to offer good value (with some exceptions). If you did want to use Alaska Miles for transatlantic biz class, I would focus on AA as they have a better product and no surcharges when using Alaska Miles (unlike with BA and to a lesser extent Icelandair). Going East from Europe, I suppose the only obvious route would be 42,500 Alaska Miles for Biz Class on Cathay to Hong Kong, and then 30k for Biz or 45k for First to NZ. Hope that helps – let me know if you have any questions at all though! Thanks guys for your suggestions. I guess the BA J isn’t a problem climbing over people if you are in an inside J seat as I’m travelling with my husband so only him to climb over! I’ll look into Norwegian Y class for EUR-US, as long as it’s a day flight and I have an aisle seat I guess we will be ok. Virtually no availability US-Fiji-NZ on Fiji airways for the whole year in J via AS. Hate those mixed cabin awards as previously mentioned on here. The long haul is 90% of the time in Y! The airlines should be obliged to show whether the main flight is in premium. You can waste a lot of time drilling down those mixed cabins. To go US-NZ via Cathay have to go US-HKG, then HKG-NZ. That’s a lot of flying, even in J!! Both 12 hour flights. I was looking at one stage into AS awards HKG-YVR-NY on Cathay J and got different answers from the AS operators. One said you can count YVR as a stopover, the other said you couldn’t. I might try that again. I’ll look into going via Qantas first, is that US-Aust-NZ? Does anyone know what availability is like there? What is the best place to search this for AS, is it on AS site itself? Have been monitoring the CX J Eur-HKG-NZ awards (with AS miles) on the BA site and there is lots of options out of Europe, even Dublin! But I wouldn’t mind going home via the US. Also noticed CX J opens up periodically but the key flight for me is the direct flight HKG-NZ where it’s sporadic with availability and then connections don’t work sometimes. I find it’s generally early to mid week where there is CX J availability. Unfortunately, US to Oceania is something that we rarely look into. I know that you can book Qantas via AS online, but I get the impression that J award space isn’t all that easy to track down. And, indeed, the mixed cabin thing can be annoying.